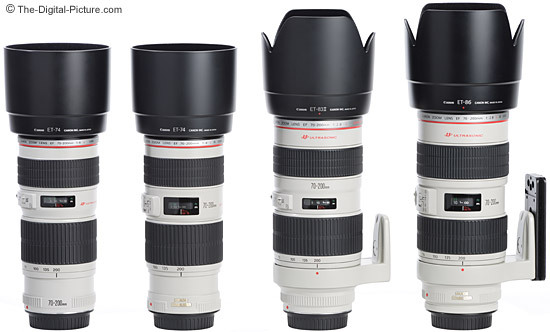 Note: The Canon EF 70-200mm f/2.8L IS USM Lens has been replaced by the Canon EF 70-200mm f/2.8L IS II USM Lens. Prior to the Canon EF 70-200mm f/2.8L IS II USM Lens being introduced, the Canon EF 70-200mm f/2.8L IS USM Lens was my favorite and one of my most-used lenses. Combining a very popular and very useful focal length range with excellent image quality, professional build quality, superb autofocus performance, a fast aperture and one of my favorite features - Canon's valuable 3-stop Image Stabilization - makes the 70-200 IS one of Canon's most desired lenses. When I really need to make every shot count, the 70-200 IS is one of the first lenses I will include in my bag. It is one of the most-professionally-used lenses available and finds a home in the kit of many, many serious amateurs as well. 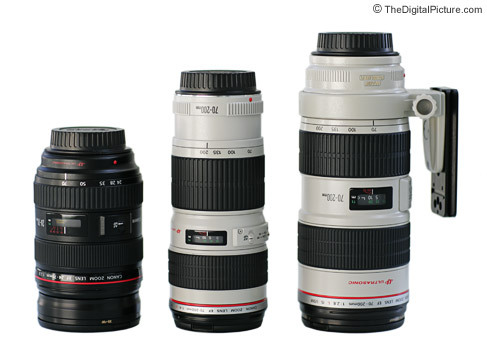 Pictured above from left to right are the Canon 24-70mm f/2.8L USM Lens, Canon 70-200mm f/4L USM Lens and Canon EF 70-200mm f/2.8L IS USM Lens. The 70-200 IS is shown with the included tripod ring and an accessory Wimberley P20 Lens Plate. 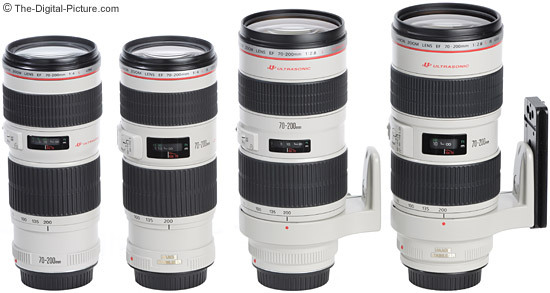 Like all of the Canon L Series Lenses, the Canon EF 70-200mm f/2.8L IS USM Lens' build quality is very high. High build quality often results in a size and weight penalty. Weighing 3.24 lbs (1470g) and measuring 3.4" x 7.8" (86.2mm x 197mm), the 70-200 IS will not be mistaken for a light or small lens. However, I can carry this lens for long periods of time without feeling it is a burden. This is a weather sealed lens that is ready to take professional use (or should I say "abuse"). The Canon EF 70-200mm f/2.8L IS USM Lens balances out great build quality with excellent image quality. Images are sharp wide open (f/2.8) - corner performance is remarkable even with a Full Frame body. Stopping down to f/4 delivers even sharper results with better contrast. I have received some comments on the ISO 12233 resolution chart samples for this lens - some think they are too soft at f/2.8. As I get time, I retest questionable results - Or even buy another copy of the lens to insure accurate but expectable results. I re-tested this lens and the Canon EF 70-200mm f/2.8L non-IS USM Lens at the 200mm focal length using AF, MF and bracketing - obtained results were identical. The chart is tough on optical performance, and real life images do seem sharper. I use this lens wide open much of the time - the results are quite satisfactory to me. Stopping down from f/2.8 to f/4 will show a difference - and will make this lens very close in performance to the remarkable Canon EF 70-200mm f/4L IS USM Lens at the same aperture. Color and contrast are good. Some CA is present (especially in the upper focal lengths). Vignetting is well controlled, basically only showing in the corners at f/2.8 and encroaching the most at 200mm. I notice slight barrel distortion at the 70-200's widest focal lengths full frame body. Distortion is not an issue with a 1.3x or 1.6x FOVCF body. Utilizing an 8-blade circular aperture, the Canon EF 70-200mm f/2.8L IS USM Lens delivers foreground/background blur quality that is renowned. It doesn't get much better than this. The longer included focal lengths will create a diffuse background blur as well. The Canon EF 70-200mm f/2.8L IS USM Lens delivers fixed focal length lens performance in a much more versatile (in my opinion) package. Use the included ISO 12233 Resolution Test Chart sample crops to compare the 70-200 IS with some of the fixed focal length lenses in this focal length range such as the Canon EF 135mm f/2.0L Lens and the Canon EF 85mm f/1.2L II USM Lens. The primes have some advantages (a wider aperture is one of the biggest) and I use them, but the versatility of 130 other instantly-available focal lengths causes me to far more frequently use the 70-200 IS. Having zoom versatility can mean the difference between getting the shot and getting nothing with a young, energetic child. Any cropping required on a picture shot with the prime will quickly negate any image quality advantage it has. The Canon EF 70-200mm f/2.8L IS USM Lens' internal focusing is very fast, quiet and accurate thanks in part to Canon's excellent Ring USM (Ultrasonic Motor). An autofocus range limitation switch enables enhanced autofocus performance. Aside from a very slight amount of play in the focus ring (not enough to impede manual focusing), the zoom and focus rings are very smooth and nicely sized. The objective lens does not rotate or extend with focusing (or with focal length changes). 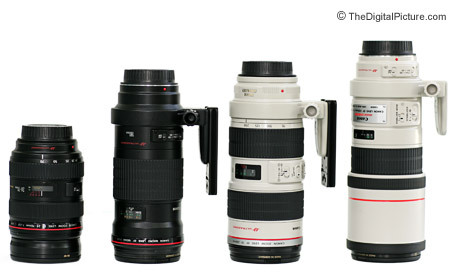 In the above comparison picture from left to right are the Canon 24-70mm f/2.8L USM Lens, Canon EF 180mm f/3.5L USM Lens, Canon EF 70-200mm f/2.8L IS USM Lens and the Canon EF 300mm f/4.0L IS USM Lens. The 180 and 70-200 have Wimberley P20 Lens Plates mounted on them. Canon's excellent Image Stabilization (IS) allows the 70-200 IS to be handheld in 3 f-stops lower light level than the non-IS Canon 70-200 f/2.8L USM Lens. I can handhold this lens at 200mm with a shutter speed as low as 1/30 and maintain a decent hit-rate whereas the non-IS lens would require a shutter speed of at least 1/200 to yield similar results. The included Mode-2 IS is designed for panning. Use it for a subject moving in one direction - pan the camera with the subject. Good subjects for Mode-2 IS include a bicyclist or a vehicle. Blur the background with motion - leave the subject sharp with good depth of field. Keep in mind that Image Stabilization will not stop subject motion. Moving subjects such as a running soccer player will require higher shutter speeds (or a bright flash) to stop the action - Image Stabilization does not help in these situations. Many people question the additional cost of the IS version of the 70-200 f/2.8. My advice - unless you are only shooting fast action or in bright lighting conditions, go for the IS version. With a relatively long closest focus distance of 55.1" (1400mm), the 70-200 IS is not going to be confused with a macro lens. A maximum magnification of .17x can be a limiting factor for very tight portraits with this lens on a full-frame body. Of course, extension tubes can help - taking the maximum magnification to .22x and .41x for 12mm and 25mm tubes respectively. The maximum magnification at 200mm is actually less when extension tubes are used (.06x and .14x) than when they are not present. Native maximum magnification is achieved at 200mm. A tripod ring, a lens hood and a nice lens case are included in the box when the Canon EF 70-200mm f/2.8L IS USM Lens purchased from a reputable retailer. With a 77mm filter size, it is easy to share filters across Canon's L lens series zooms. I find MANY uses for my Canon EF 70-200mm f/2.8L IS USM Lens, but portrait photography is where this lens shines for me. I would choose the 70-200 IS over everything else if I were going to take out-of-the-studio portrait pictures - especially candid portraits. Some may find the 70-200mm focal length slightly long on a 1.6x FOVCF body, but this lens would still be my personal choice. Image Stabilization lets me take indoor daylight-lit portraits without additional lighting (with a still subject that is). Outdoor sports photography is another popular use for the Canon EF 70-200mm f/2.8L IS USM Lens. I say outdoor sports because f/2.0 or higher is often required to achieve a high enough shutter speed to stop indoor sports action. If the 70-200 f/2.8L IS is what you have, definitely use it for indoors sports. You will likely need to use ISO 1600 or 3200 to stop the action. Of course, if your indoor sports lighting is exceptional, this is the perfect lens to use. OK, back outdoors ... The 200mm maximum focal length is fine for even the big field events if you are using a 1.6x FOVCF body and/or a Canon Extender EF 1.4x. More serious field sports (soccer, baseball ...) photographers prefer even longer focal lengths such as those available in the Canon EF 100-400mm f/4.5-5.6L IS USM Lens - is a very good alternative for this use. While the pros often shoot these sports with a Canon EF 400mm f/2.8L IS Lens, they frequently have another camera body with a 70-200 IS mounted on it for the closer action. The wide f/2.8 aperture availability can be a big help for those early morning, late evening or heavily overcast events. Going for a walk in the park or to the beach with the family? The 70-200mm focal length is great for candid shots of the loved ones. Some think the 70-200 IS weighs too much for this use; most don't mind the weight after seeing their results. The Canon EF 70-200mm f/2.8L IS USM Lens is frequently employed at weddings. Lack of light is generally not a problem at outdoor weddings, but indoor weddings (and receptions) are usually light-challenged. There is not a lot of action (movement) during most wedding ceremonies and IS can be very helpful in this situation. 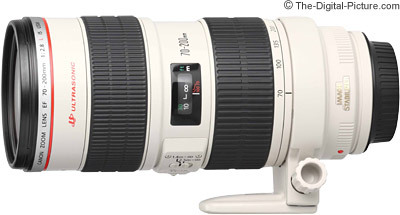 The 70-200 zoom range lets you take a variety of shots without intruding on the ceremony. Capturing unsuspecting subjects results in more-candid shots. Indoor church and stage performance photography can be a great use for the Canon EF 70-200mm f/2.8L IS USM Lens as long as the subjects are not moving too much. Indoor and outdoor event photography is another great use. General wildlife photography is another area where my Canon EF 70-200mm f/2.8L IS USM Lens finds occasional use. When paired with the Canon Extender EF 1.4x II on a Canon body with a 1.6x FOVCF, this lens starts having some significant reach. If you plan to use this lens with an extender most of the time, I once again suggest you look at the Canon 100-400mm f/4.5-5.6L IS USM Lens or the Canon 300mm f/4.0L IS USM Lens as performance with the 1.4x is decent but not exceptional. The 70-200 f/2.8L IS is also compatible with the Canon Extender EF 2x II, but not everyone will be satisfied with the results of this combination. The Canon EF 70-200mm f/2.8L IS USM Lens is not an inexpensive lens, but it is very worth the price in my opinion. I considered this my second most important lens with the first being a more general purpose lens in focal length range. My keeper rate from this lens is among the best of any lenses I have used. Again, the Canon EF 70-200mm f/2.8L IS II USM Lens (review) has taken the place of the now discontinued Canon EF 70-200mm f/2.8L IS USM Lens in Canon's lineup.